This collage of animals reveals just a tiny fraction of the fascinating world of zoology. Our exhibits on animals will help you make sense of the complex and beautiful story of their history. For each group of organisms (each taxon), we present information on the group's fossil record, life history, ecology, systematics and morphology. The Web pages on systematics (for instance . . .) show the various subgroups of each taxon, and are thus your connection to other exhibits in our UCMP Virtual Museum of Paleontology. If you do not want to follow phylogeny, you can always select our Web Lift to Taxa, at the bottom of most pages, to get to any of our exhibits on organisms. 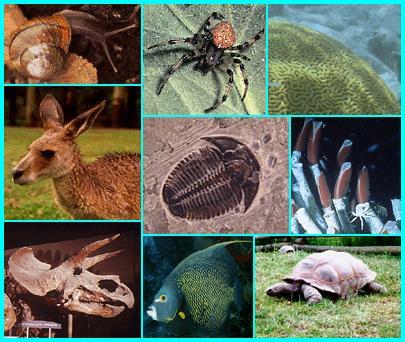 Navigate deeper into the diverse animal groups by selecting Systematics! The Electronic Zoo offers links to all sorts of information on all sorts of animals. For additional images of mostly invertebrate animals and protists, created in the 19th century by the great zoologist Rudolph Leuckart, click here to visit the Marine Biological Laboratory at Woods Hole, Massachusetts.